Is BGF also prevalent outside the walls of the prison, too? Were any of these women gang wannabes in their youth, and recruited by the gangs from the inside? Chair Mark Uncapher of the Montgomery County Republican Party obviously has a long memory, as he wrote in his latest party newsletter about a previous scandal uncovered in 2009 by the Baltimore City Paper. This is a rerun of a very bad horror movie that continues to replay throughout the O’Malley administration. Rewind the movie back to 2007, O’Malley’s first year in office. Patrick Byer is awaiting trial on a murder charge in the Baltimore Detention Center. Like many of the inmates in that facility, Byers has access to a contraband mobile phone, which he uses to negotiate a murder for $2,500 of the principal witness against him. Just 8 days before the beginning of Byer’s trial, Carl Lackl Jr. is gunned in front of his house in a crime witnessed by his daughter. What’s perhaps more amazing is that Antonia Allison, who was cited in that City Paper story as being one of the correctional officers alleged to have gang ties, is also under indictment in the newest scandal. One would have thought the slightest hint of gang activity would have gotten her out of the correctional system, at least as a guard. But she remained and is one of the 13 correctional officers newly accused. Understandably, the prison population isn’t adding any value to society and very, very few people aspire in their life’s wish to be prison correctional officers. Moreover, the percentage of correctional officers who are tied to gangs is probably fairly low (although it likely varies from facility to facility) but it’s obviously enough to shift the balance of power in the Baltimore City facility. For those highest up in the gang’s food chain, jail wasn’t punishment at all but simply a place to do business with decor which left something to be desired. 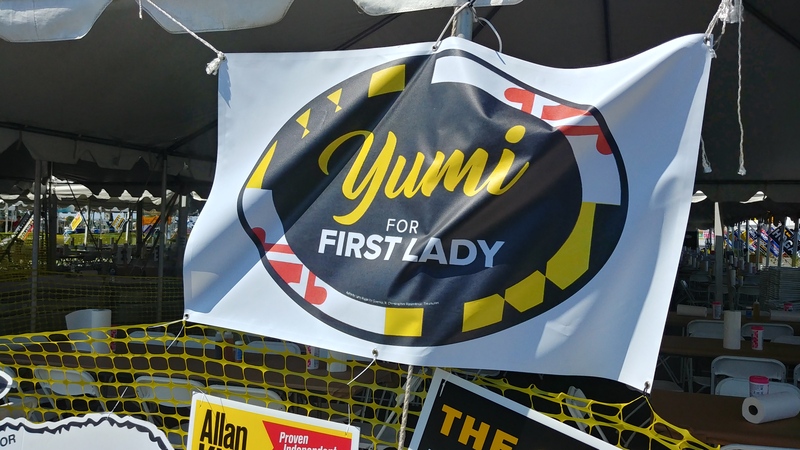 This isn’t going to add to Martin O’Malley’s Maryland legacy, although it may be an interesting thing to bring up for Lieutenant Governor (and 2014 gubernatorial candidate) Anthony Brown and perhaps Attorney General (and also prospective candidate) Doug Gansler. But as the meme points out, Martin O’Malley has set his sights on a higher office since about the time the results of the 2010 election became official. Priorities for him seemed to shift from the actual idea of governor a relatively small state to burnishing his resume. Running prisons? That’s boring, and they probably can’t vote anyway – let’s pander to the gays, green energy crowd, and illegal immigrants! And one has to wonder as well about the state’s other prisons. Looking at crime in Salisbury, which is a known resting stop for families who have loved ones locked away in the Eastern Correctional Institution outside Princess Anne – conveniently about as far away from the I-95 corridor as you can get in this state but not too close to Ocean City to scare away the tourists – one has to ponder to what degree this is a problem in ECI. Like Baltimore City, Somerset County is one of the state’s poorest areas so jobs, particularly for those without a great deal of education, are scarce. Granted, the fact that ECI is in a rural setting alleviates some of the issues found at the Baltimore City facility but being inside is still being inside. But now that environment affects us outside the prison walls. That’s the problem with ineffective leadership, and it’s something which will need to be addressed in 2014 when the state next votes. I know a lot of people have been waiting with bated breath for this, so let me tell you that if a picture is a thousand words this will be a post upwards of 32,000 words. And I didn’t think I took all that many pictures. 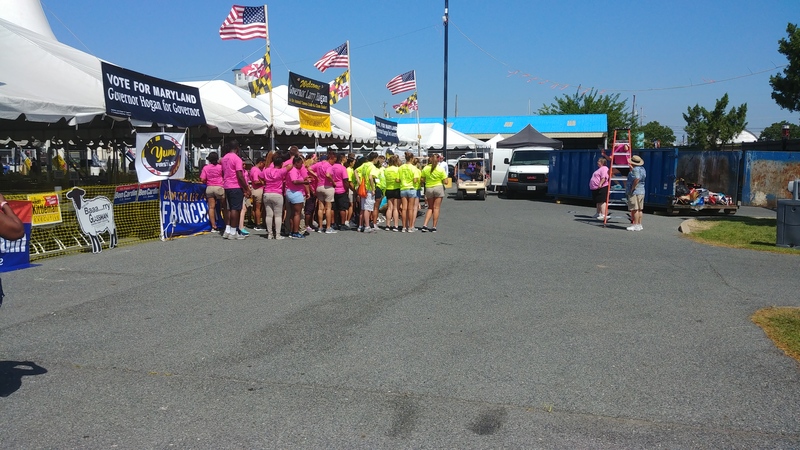 Nor did it seem like this year’s edition had the crowds that previous recent Tawes gatherings did. 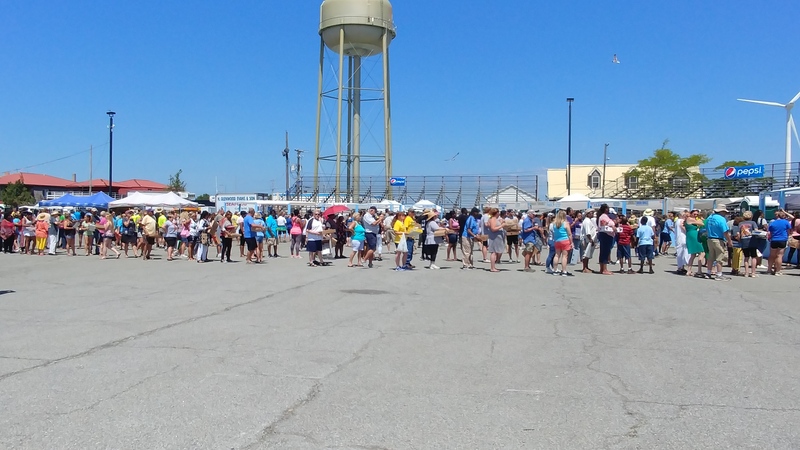 Perhaps this falls in the category of anecdotal evidence, but I climbed up to the top of the bleachers and took this panoramic photo just before 1 p.m. – a time you would think there would be huge, long lines. 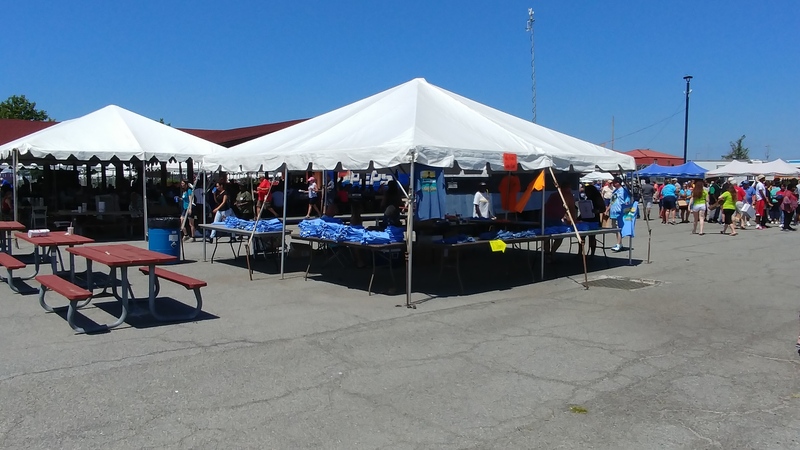 Both of these entities are there every year, with Eddie Heath providing the tent “fencing” for another longtime client, the Hebron Savings Bank. And it goes without saying that this event is an important part of Somerset County’s economic development. But I spied a couple new entities I was unfamiliar with, too. The Great Bay Wind Energy Center is being pushed by Somerset’s economic development team, as they seek a 65-turbine complex. Despite its name, the wind farm is planned for an inland site near Marion Station. The second could be an exciting development on the entertainment front. The first concert at The Amphitheater at Heron Ponds will be a free show featuring local ’80’s bands on August 24; a shakedown cruise if you will for its first major event featuring country singer Kellie Pickler on August 25. They also win the creativity award for keeping the beer cold. If you’re scratching your head as to why I found it humorous, here’s a wider view. 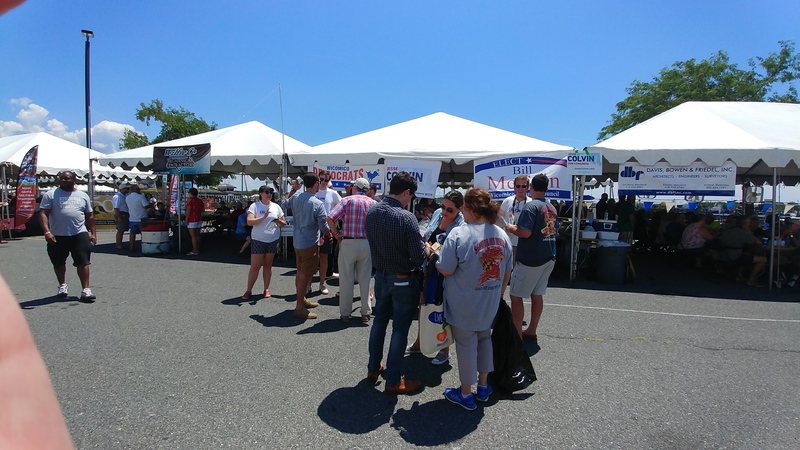 But the reputation of the Tawes Crab and Clam Bake was built on the perception that it was the place for Maryland politicians to see and be seen. Despite the smaller crowds, this year was no different. Of course, you had the two party tents. I’m biased, so the GOP goes first. One advantage the Democrats had was a little grassy area for easy sign placement. They had the usual fare: Obama, Cardin, Rosen, Conway. Norm Conway? He’s not up this year, is he? Nor is Blaine Young of Frederick County. 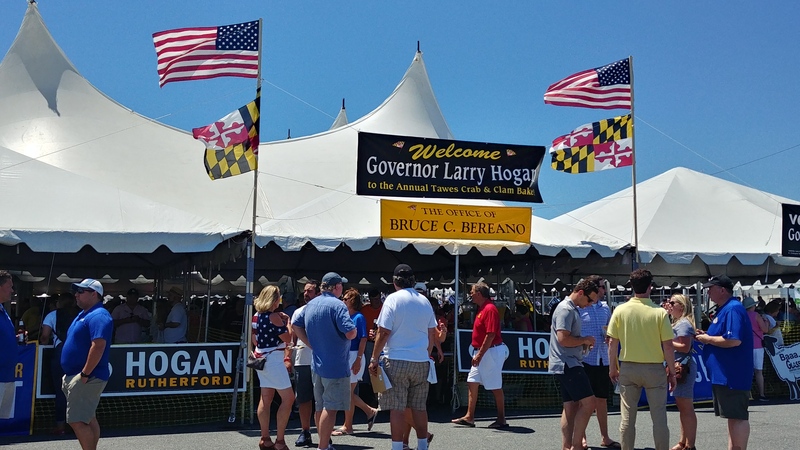 But he is planning a 2014 run for Governor on the GOP side so he secured his own tent. But the granddaddy of all political tents didn’t belong to a party or a candidate. Instead, it belonged to a lobbyist. It even had fans stationed along one side of the perimeter. Unfortunately, you cannot read the cards, but various politicians had reserved tables inside the tent. These two were saved for Delegate Cheryl Glenn and State Senator Joan Carter Conway. They weren’t the only ones. 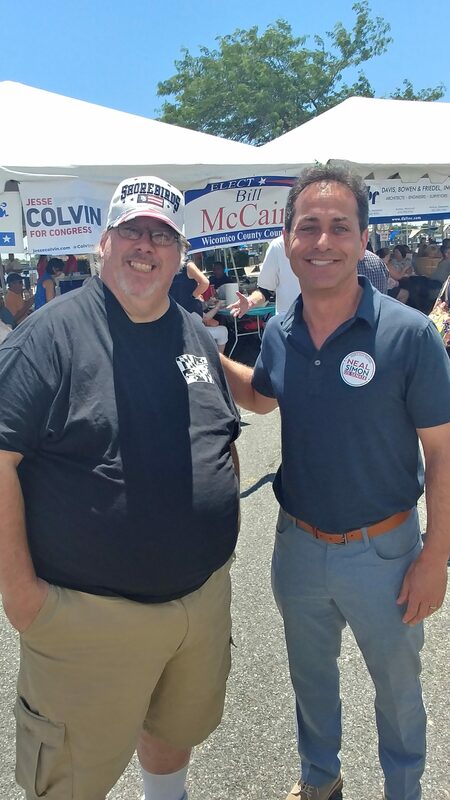 However, I must say that Bereano is bipartisan – a goodly number of the pictures below were shot in front of his tent, which was conveniently across from the GOP tent. 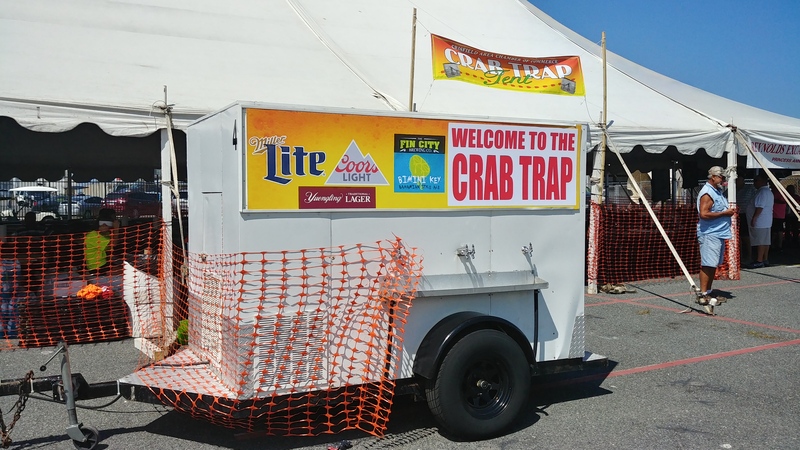 And as I said above, those who wanted to see and be seen were in Crisfield, the southernmost city in Maryland. (Bet you non-locals didn’t know that.) I have a lot of these photos, so I suppose I’ll begin with statewide races and work my way to local ones. 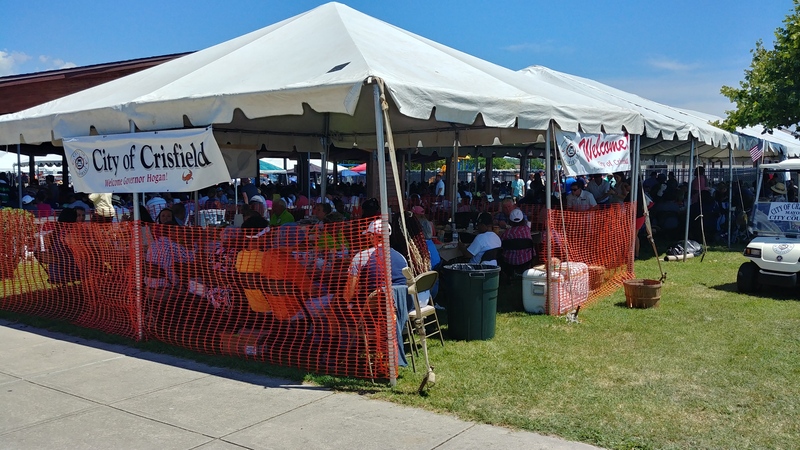 Since I already revealed Blaine Young had a tent for his 2014 gubernatorial bid, I’ll start with him enjoying his lunch within. To be honest, this was the biggest splash his nascent campaign has made, as he has a little catching up to do with two of his fellow presumptive GOP contenders. 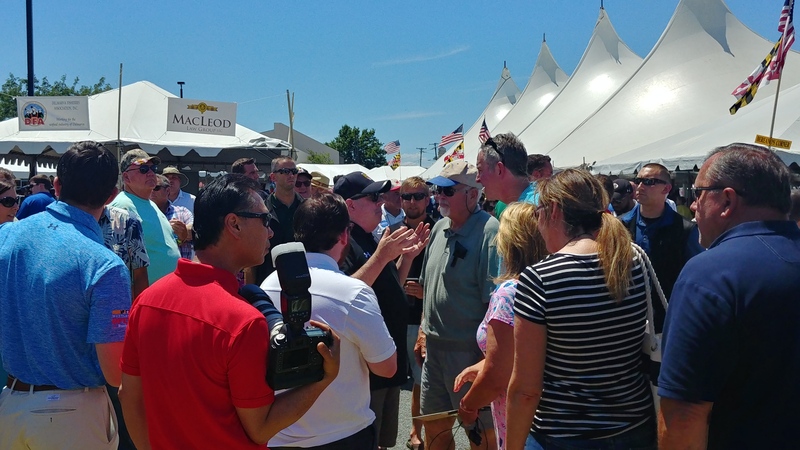 Larry Hogan (right in photo below) was in the house, sporting his Change Maryland logo with Red Maryland blogger and state YR head Brian Griffiths. 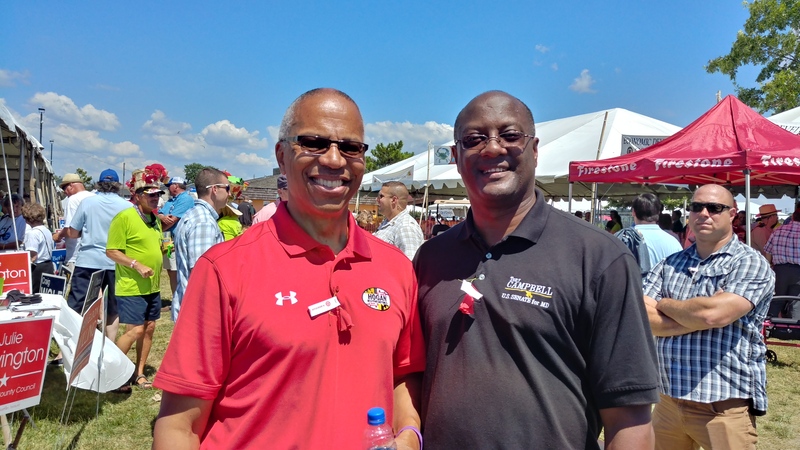 Griffiths is apparently an equal opportunity gladhander, since he’s also here with Harford County Executive David Craig, the unofficial-official candidate for Governor in 2014. 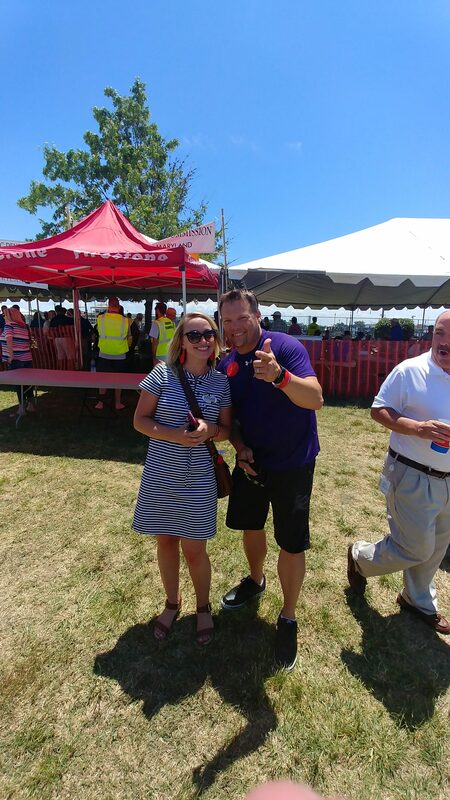 On the other side, Howard County Executive Ken Ulman is thought to be considering a run for the Democratic gubernatorial nomination. 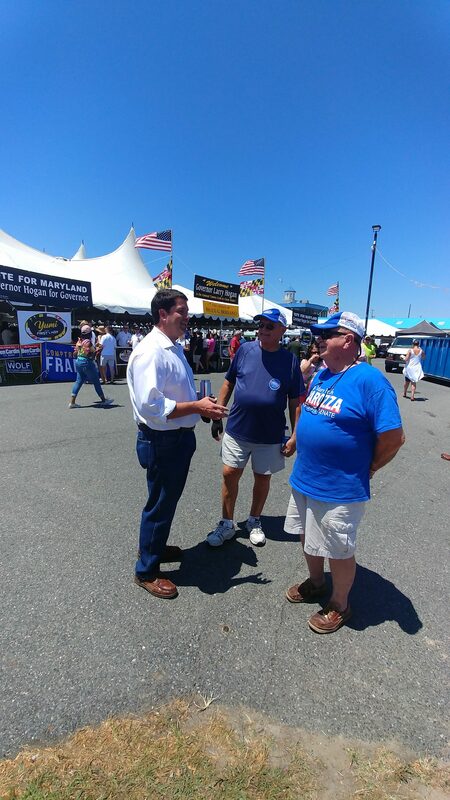 He’s on the right, Wicomico County Executive Rick Pollitt (who introduced me) is to the left. 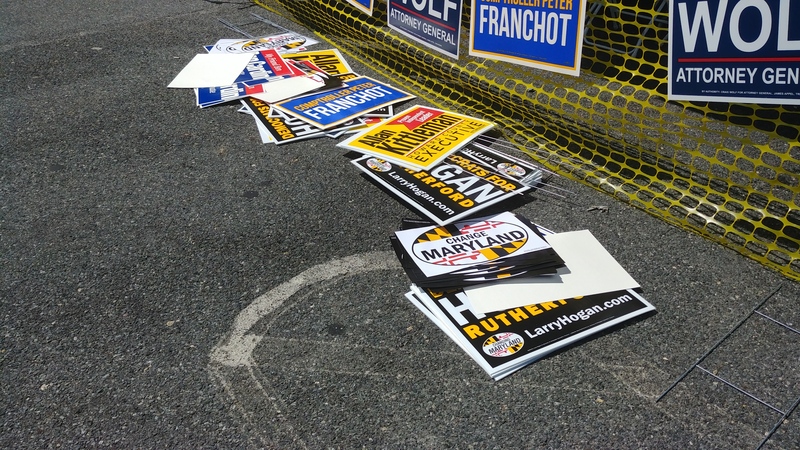 I’m also told Peter Franchot, who may run in 2014, was there as well but I didn’t see him. There was one other statewide candidate there, at least that I’m aware of. Let’s just put it this way. I arrived at 11:00, and Dan Bongino was there 15 minutes later (note that the event officially started at noon.) The photo below was the second one I took. He stayed and sweated it out (literally) until almost the bitter end. 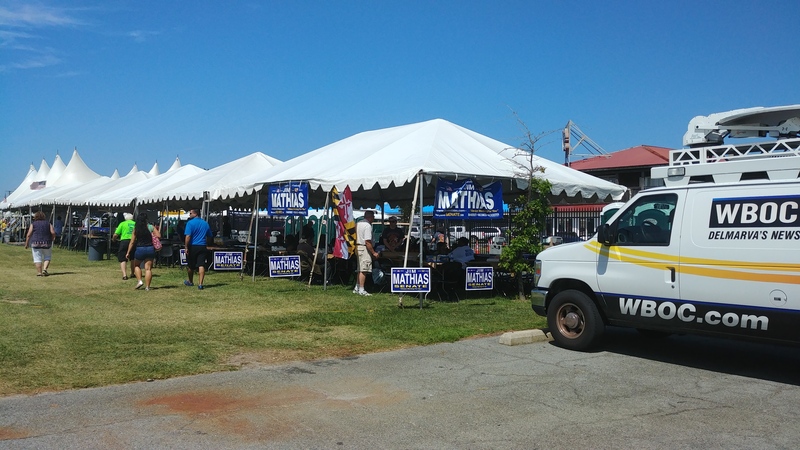 And while I show him by the GOP tent in this picture, he was all over the Somers Cove complex getting votes. 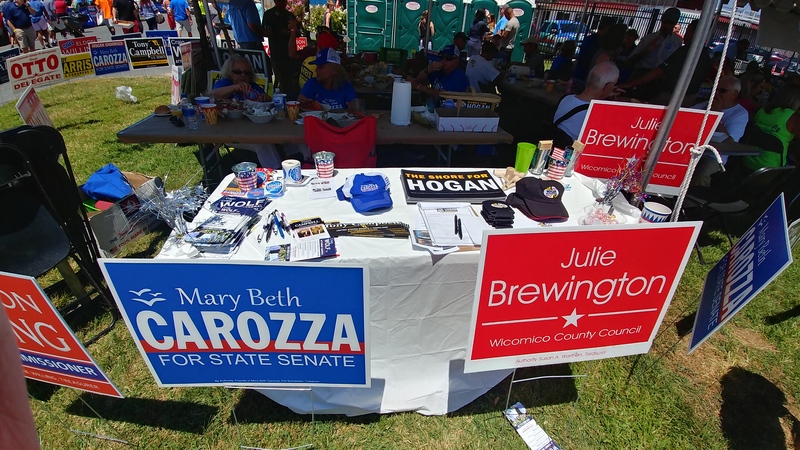 And they didn’t forget to get more volunteers, as the Bongino signup sheet was prominent on this table. 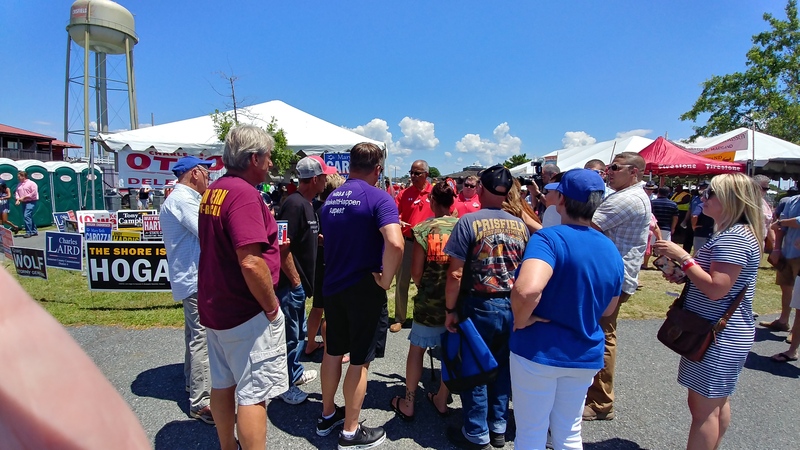 An advantage Bongino and other challengers had was the fact the incumbents were working today in Washington. 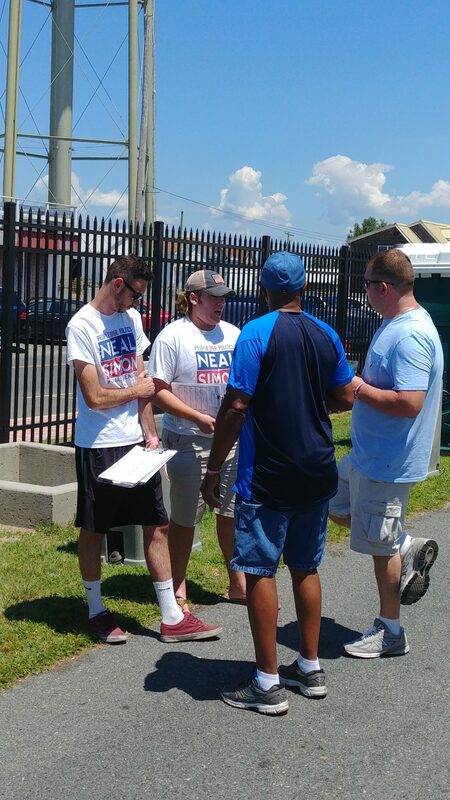 So Ben Cardin couldn’t walk the grounds gathering votes, and nor could Andy Harris in the local First District race. 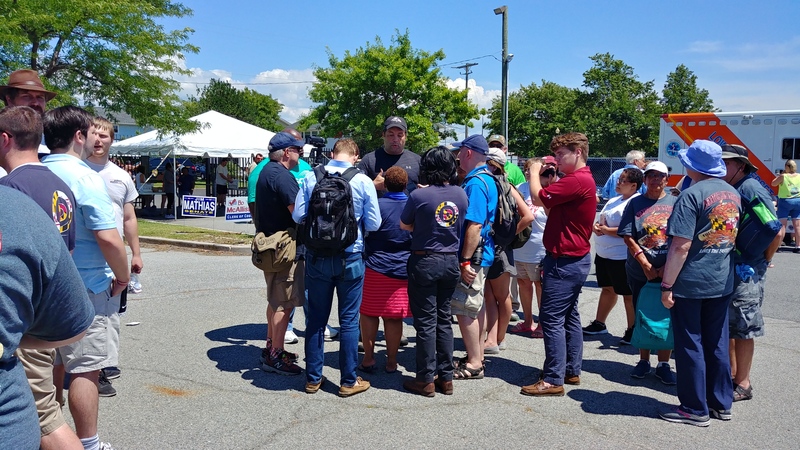 But Harris had a good volunteer turnout. Opponent Wendy Rosen had her own small posse of backers, too. I had never met Rosen before today, so I wanted to put a face to a name. She’s a nice enough lady, but when she remarked something along the lines of Republicans selling their souls to the Koch Brothers, well, let’s just say the class envy card isn’t accepted here. The Second District could have much better representation with this lady, who obviously approves this message. 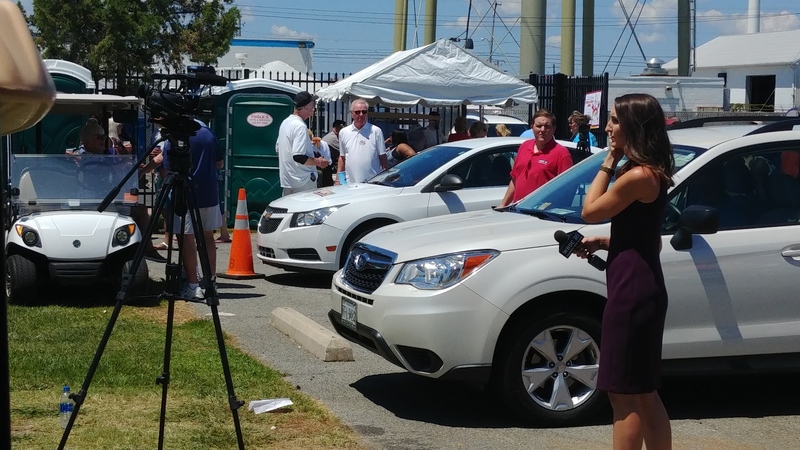 It was nice to see her get some airtime, although the local TV station isn’t in her district. I wish I had gotten a better photo of Third District hopeful Eric Knowles (on the right) but this will have to suffice. While most state and local politicians aren’t on the ballot for awhile, there is one exception. Salisbury Mayor Jim Ireton is up for re-election in early 2013. Here he’s on the left (which seems to be the norm) but being bipartisan is Delegate Charles Otto, on the right. General Assembly members from near and far came to participate. 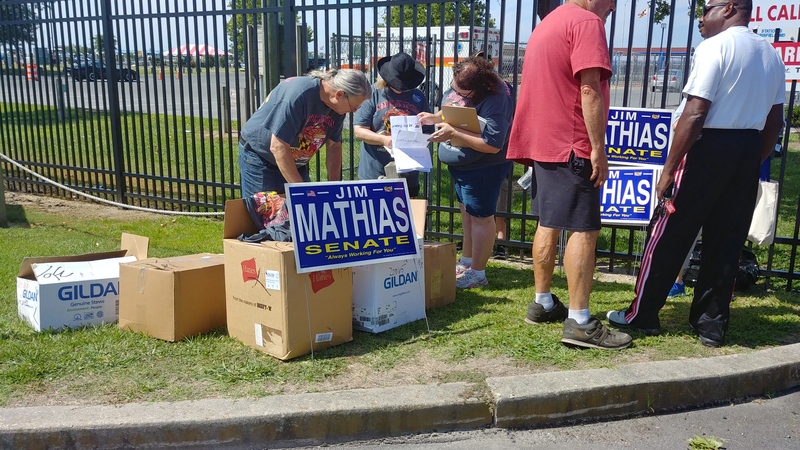 Delegate Mike McDermott was rolling up his sign as the day wound down. State Senate Minority Leader E.J. Pipkin had one of his supporters in tow. 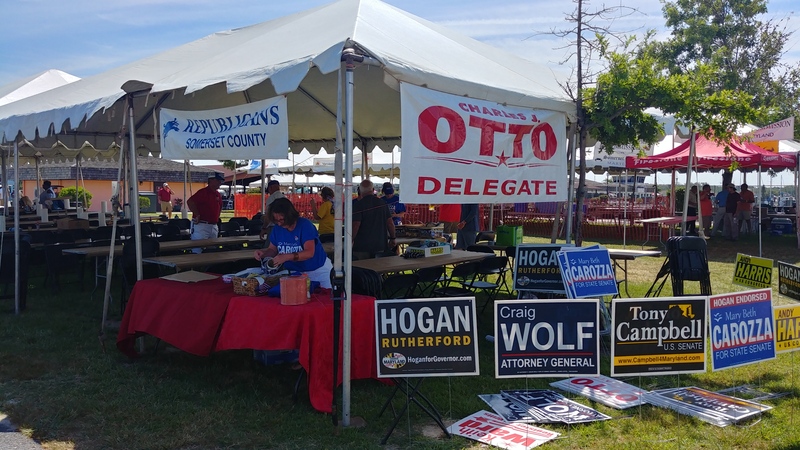 Here’s that Brian Griffiths guy again, in front of the Bereano tent with Delegates Kathy Szeliga and Justin Ready. Truly, though, it’s better Griffiths be in front of the camera and me behind it than the other way around. And maybe politics is in the future of these two lovely young ladies – after all, they’ve won one contest already. The outgoing Miss Crustacean and Little Miss Crustacean will turn over their crowns at the Hard Crab Derby in September, but Hannah Adkins (left) and Jessica Wilson (right) seem to be having fun with their titles for now. They definitely have winning smiles. And by next week those who normally frequent the Somers Cove Marina can have their facility back. 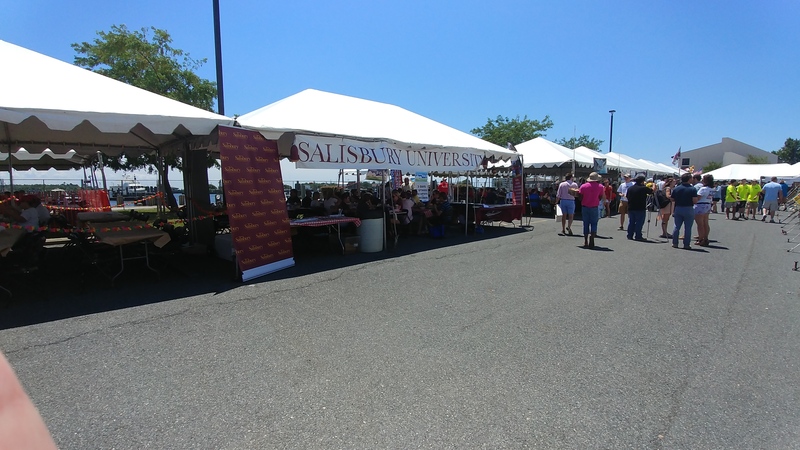 So with that another Tawes Crab and Clam Bake is in the books. Next year should be a little more active since the 2014 campaign will be in full swing. Oh, and I would be remiss if I didn’t mention some of my local blogging cohorts there. 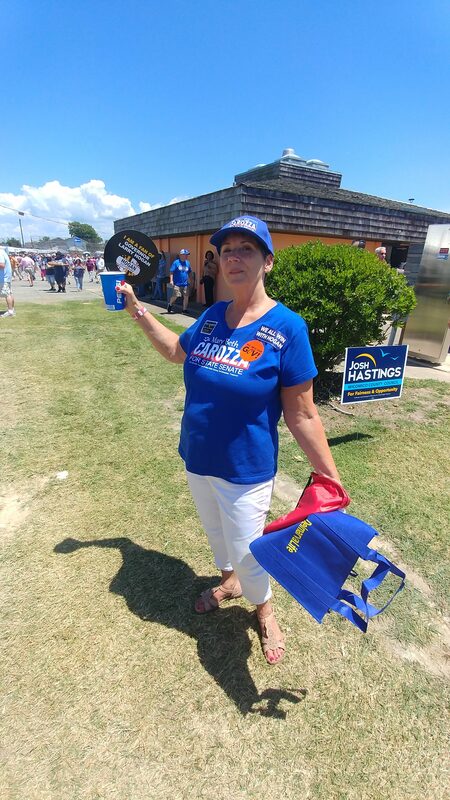 Since Jackie Wellfonder was busy coordinating Dan Bongino’s effort she may not put anything up on her Raging Against the Rhetoric site, but Julie Brewington of Right Coast Conservative was snapping a number of shots for herself while Jonathan Taylor of Lower Eastern Shore News has his observations as well.